As a vegan, finding an ice cream that does not include dairy but still tastes as creamy and sweet as dairy ice cream is difficult. Yes, some vegan ice creams at grocery stores may have some taste, but most lack texture and instead have a watery consistency. 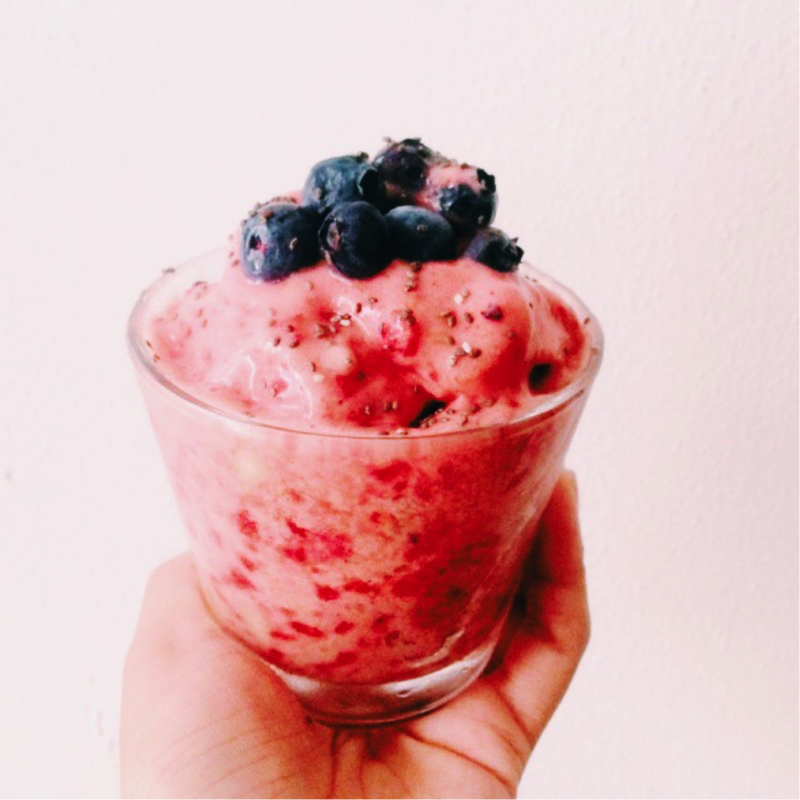 The following recipe is a completely raw, vegan ice cream recipe that requires frozen fruit. The most important part of the recipe is the freezing of the fruit. For starters, bananas are a must; their thick and creamy texture mimics dairy ice cream. Bananas are the basis for the ice cream, and then all supplementary ingredients help to flavor it. Any fruit being added to your ice cream should be frozen, and the longer it is left in the freezer the less watery and more compact of an ice cream will result. For easier blending, make sure to cut fruit before storing in the freezer, as shown above. 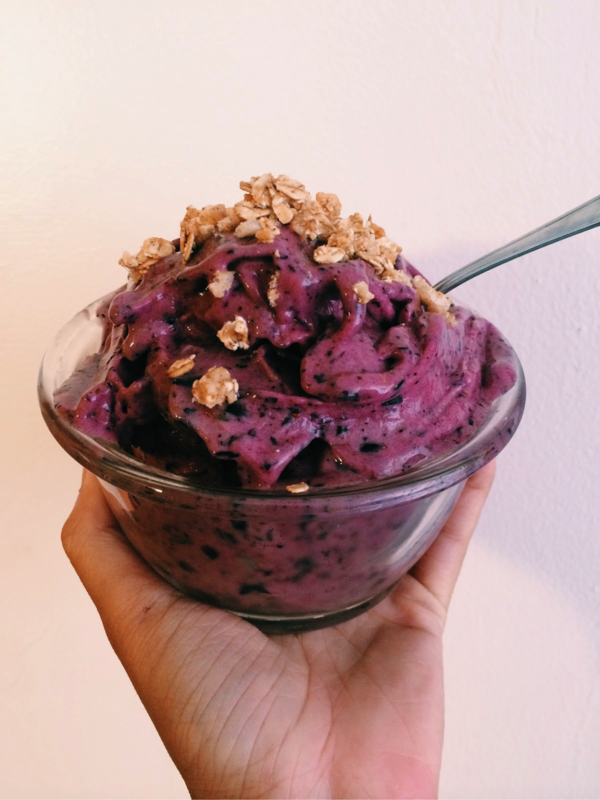 Below is a vegan ice cream made from frozen blueberries and mangoes that I had stored for only four hours, which gave it more of a watery texture. For a thicker consistency, like the blueberry ice cream (fourth picture), consider freezing your fruit overnight. The ratio of banana to other fruit should be 2:1, for every one serving of other fruit, use two bananas and that will give you the creamiest consistency. The stronger the blender, the easier it will be to blend the frozen fruit. When using an average blender, it’s important to add small amounts of frozen fruit at a time, until each addition fully blends. When adding more fruit, make sure to scoop up the already blended fruit to make room for the frozen fruit being added. If the fruit gets stuck, use either a spatula or spoon to mix before blending again. 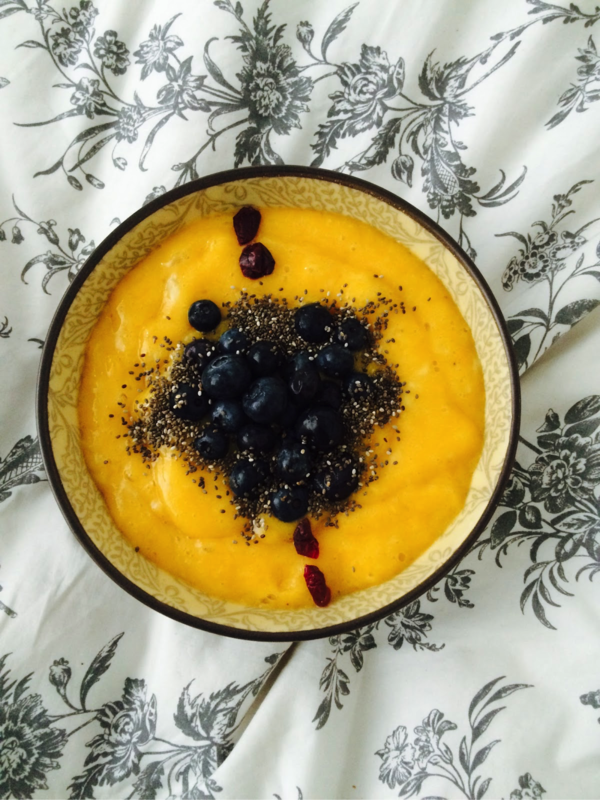 Besides adding additional fruit such as blueberries, mangoes and strawberries, one could also add cacao powder, mint extract, etc. to add flavor. The great thing about a frozen banana base for ice cream is that the finishing flavor is what you make of it, and the more creative you get the better. For vegan toppings that compliment raw vegan ice cream, consider cacao nibs, craisins, dates, chia seeds, dried mulberries, granola, and dates (for caramel-like chunks in your ice cream, consider chopping some dried dates up and adding them to the blender while blending the fruit). This recipe serves as a foundation for whatever type of ice cream you have in mind, so have fun with it!